Have you ever met someone who doesn't like Chick-fil-A? I'm sure you haven't, because it's not even possible to dislike Chick-fil-A. Austin and I love Chick-fil-A. One of our favorite things there is the Chick-n-Minis. 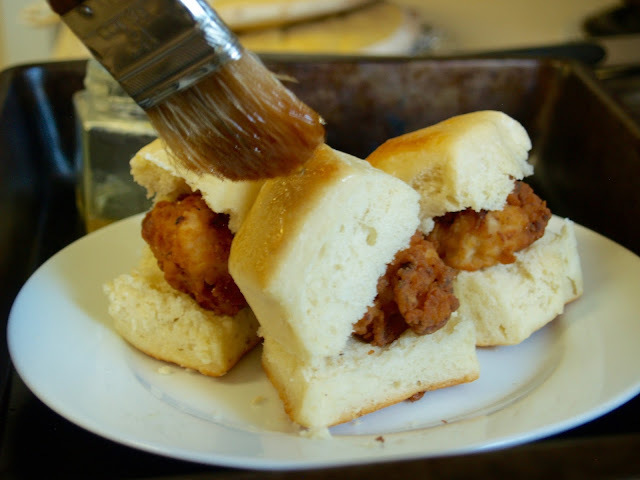 They're soft honey butter rolls . . .
. . . with Chick-fil-A nuggets inside. 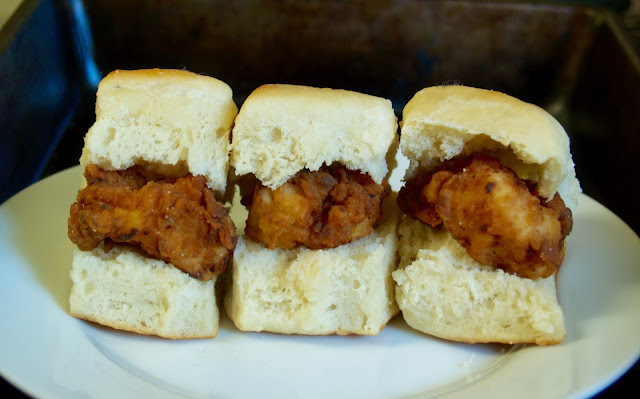 We've been making Chick-fil-A nuggets at home for some time now, but we've only just recently discovered that you can make Chick-n-Minis at home. Best way to start off 2016, if you ask me! 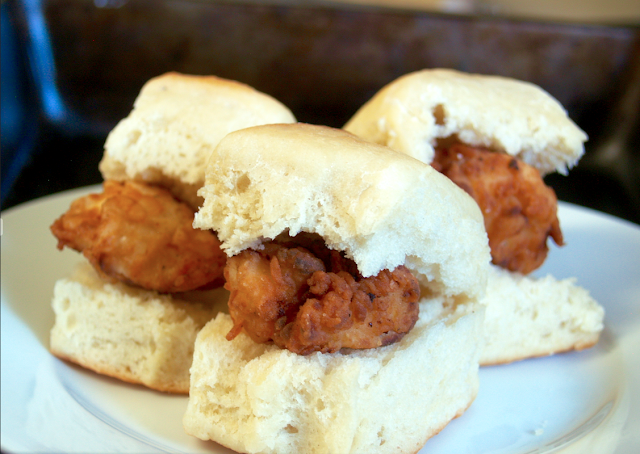 These seriously taste exactly like the Chick-n-Minis at Chick-fil-A. 1. In a medium bowl, combine warm water, 1 tbsp of the sugar, and the yeast. Let it bloom for 5-10 minutes. 2. To the yeast mixture, add the egg, salt, remaining sugar, and oil. Stir with a spoon to mix, 20 seconds or so. Put flour into the bowl of a stand mixer fitted with a dough hook. Add the yeast mixture to the flour and mix/knead until all the flour is incorporated. 3. Let rise in a warm place until doubled in size, about 1 hour. Roll out to 1/2" on a lightly floured surface. Butter a 9x13 pan and spread the remaining butter on the dough. Cut into 24 squares using a pizza cutter. Let rise, covered, until doubled in size. 4. Bake at 350 degrees fahrenheit for 20 minutes, or until the tops are golden. Brush with honey, if desired. 1. Combine egg and milk. Add chicken and soak in the fridge for at least 30 minutes, up to overnight. 2. Combine the dry ingredients in a bag. Heat up oil to 350 degrees fahrenheit. Add a couple of pieces of chicken to the dry ingredients and shake. Add them to the hot oil and cook for 3-4 minutes, or until golden brown. 3. Remove onto a paper towel and put inside honey-butter rolls. Enjoy while they're hot! I made these rolls last night. It was so quick and the recipe was easy to follow. They are devine!!! 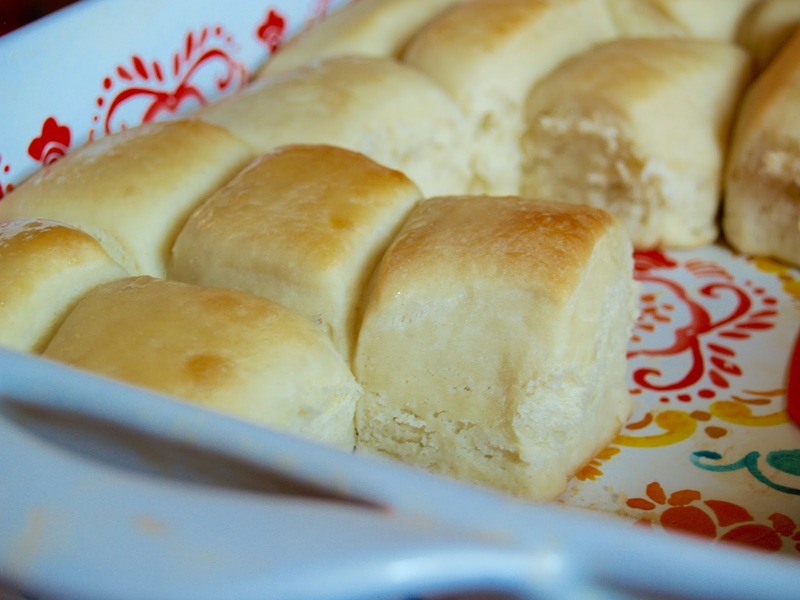 The rolls are soft and fluffy and absolutely delicious. Thank you for sharing this recipe, I am sure it will become a household favourite! I am so glad you liked them! I'm also happy to see I have a reader in South Africa-- my husband lived in South Africa and Botswana for 2 years. That reminds me, I need to try out some more South African recipes! Is it common to have to add more than 4 cups flour? I ended up having to add about 5 cups because the dough was so sticky and pasty, and not like "dough" until I added the extra flour. Or, are there any tips to avoid the sticky and pasty consistency? I followed the recipe and instructions exactly, except for the added flour before letting the dough rise. I made the rolls for breakfast yesterday. They were delicious! Do you use instant yeast? can you freeze them after you make them? If you put a little butter on your hands and then knead the dough with your hands. The butter keeps it from sticking. I like to use butter rather than oil on my hands because it doesn’t change the flavor or texture. It will start to shape up without having to add the extra flour.